The aim of this paper [i] is to analyze the persuasive effectiveness of the video Vivamos como Galegos [Let’s live like Galician] and to underlie its three main features: 1) indirectness; 2) emotiveness; 3) multimodality. Galicia is one of the 18 Spanish administrative regions. The local language is Galician (a variety of Portuguese), which is spoken, not without some complexity, together with Spanish. A very strong feeling of local identity is common within the inhabitants of this country. This feeling has become a real nationalist stance, which has also institutional expression in political parties. In 2007 a Galician local company called GADISA (Gallega Distribuidora de Alimentos, i.e. Galician Food Supplier) started a campaign in order to increase its sells in its supermarket chain called GADIS. The commercial reach of the campaign is Galicia itself. The campaign is aimed at enhancing GADIS market against its main competitors, which are all foreigners: Carrefour, Alcampo, and Día (France), Lidl (Germany), Eroski (Basque Country, Spain), Mercadona (Valencian Community, Spain). The campaign was designed by the advertising company BAPConde and utilized various forms of media (TV, radio, posters, web, etc.). The campaign started with the video we treat here. All the videos or advertisements feature the same concept: praising the Galician way of life, trying to reverse a previous feeling of inferiority, and transforming this inferiority into pride or in feeling of superiority for being Galician. We chose to deal with the video Vivamos como Galegos, because it was the original, it was the first broadcasted on television, and it was by far the most popular of the series – people frequently use expressions employed in the commercial, or they consciously stress behaviors displayed in the video, or their mobile phone tone is the video’s soundtrack. The video also had commercial success: as states Miguel Conde, President and Art Director of BAPConde, thanks to this video, the selling volume of GADIS increased 4.7%. A transcription of the video with its translation in English and short descriptions of characters and scenarios is presented below. Every scene (S1, S2, etc.) has different characters and scenarios. We considered the performance of the main character as a single scene interrupted by other scenes. Italicized 5) and 6) indicate Spanish, instead of Galician. S1: the main character (character A) returns from a trip; his mother, father and sister are picking him up from the airport. The protagonist, sitting in the car, talks to his relatives. Except when indicated otherwise, the utterances are made by character A.
S2: two persons running along the platform in an underground station. S1: coming back to the main character in the car. 7) How can we not feel fine here? S1: view of a Galician beach from the car window, seen from the perspective of the main character. Coming back to him in the car. S3: a housewife in a kitchen, showing an omelette. S4: two persons in a rural – very Galician – setting. S1: the main character stops in the middle of the street to talk to a man walking along the street. From this point the main character talks off-screen. 22) We’re positive by nature! S6: a girl in a kitchen, eating directly from the saucepan. S7: 3 foreground shots of two refrigerators wide open, full of food. S8: two children playing in a park with a dog. S9: an elderly man walking in a park with a child. S10: an elderly man dancing with a child. S11: some young people playing table soccer. S12: a football player in a press conference; a journalist asks a question off-screen. S13: a blackboard of a restaurant with the English phrase octopus to the party, subtitled as pulpo a feira (a typical Galician course made with boiled octopus). S14: a shaking hand touches the back windscreen of a car manoeuvring for parking. S1: coming back to the main character in the square; people start moving nearer to him. S1: the main character climbs onto a car roof, talking to the people around him. 36) And if someone asks you a tricky question, ask one back! S1: the main character gets off the car and mounts a brown horse; he starts galloping in a field; more and more people come up to him: they appear from behind; he talks to them as he canters along. S15: a stadium full of people cheering. Final moments of Beethoven’s Ninth Symphony; main character’s voice is off-screen. S15: two men in a stadium sharing some food. S16: an elderly man and a young girl dancing in a rural setting. S17: some young people standing around a pot chanting a conxuro (a traditional Galician spell). S19: a woman with some grelos (turnip greens – a traditional Galician vegetable). S20: a percebeiro (barnacle hunter) in his wetsuit shows some barnacles from the sea. S21: foreground shot of fine rain falling upon some leaf. S22: image of an oak tree. S23: foreground shot of wet paving-stones. S24: a typical rural Galician house (made of granite and slate) in the rain. S25: a typical Galician house in the rain. S26: two persons playing and laughing in the rain. S1: the main character riding the horse and talking to the persons facing the sea. S27: a table in the middle of the garden of a typical Galician rural house; around the table some people are eating, and some children playing; (main character’s voice is off-screen). 49) And if you don’t go to your village on Sunday it’s not a proper Sunday. S1: coming back to the main character on horseback, alternating with shots of people standing on a hill. Protagonist keeps talking to them. 53) Let’s live like Galicians! Our methodological approach is transdisciplinary. We are convinced that complex phenomenon such as persuasive discourse (especially if it is multimedial, as in this case) can only be examined through multiple perspectives and different analytical tools. For this reason we use, for this study, Traditional Rhetoric and modern Theory of Argumentation as well as (Critical) Discourse Analysis; Semiotics; Pragmatics; Social Psychology. Even what the advertisers themselves say about advertising is taken into account. We specially draw attention to the performativity of speech acts (Austin 1962); to the idea that multimodal texts are more persuasive than monomodal ones; and to the fact that text and context are indivisible. Also two concept are fundamental for this analysis: the notion of image in the sense of Goffman (1965); and that of frame, used in the sense of Goffman (2006 ) and Lakoff (2007). Following Austin we consider speaking as form of acting: describing the world (and what is going on in it) means building it, along with conveying speaker’s attitudes and shaping listeners’ attitudes about it; describing actors means construing them, and especially their image. In doing so the speaker shows his/her attitudes about actors and shapes listeners’ attitude about them. According to Goffman, subjects construe/transmit an image of themselves in society, and they do so through actions/discourses. So subjects usually act/speak in society coherently with the image they want to construe/transmit. This is true at a microsociological level, but also at a macrosociological level, in unmediated interactive context (face-to-face) as well as in mediated ones (TV, web, radio). We can consider a subject everything that acts as a subject, for example institutions or companies, like GADIS. In order to construe and transmit an image of GADIS in/to society, GADIS 1) acts in a particular way; 2) and speaks in a particular way. This notion is also based on Goffman’s sociological research, albeit developed as a psycho-sociological tool. A frame could be defined as the system of mental structures shaping the way of seeing the world. Advertising discourses can: 1) confirm (already existing) frames, using them for economic ends; 2) confutate/change frames (or even invent a new frame), use them for economic ends: for example for opening new markets or redirecting consumers’ attitude/behaviors. Actually, changing frame means changing the way of seeing the world and living in it. Persuasive discourses could be aimed both at giving (or managing) some image of the speaker or changing/strengthening some frames in order to achieve certain goals. As Blommaert puts it: “context is not something we can just ‘add’ to the text – it is text, it defines its meaning and condition of use” (2005: 45). From this perspective text and context (if it is really possible to define where the former finishes and where the latter starts) are in a circular relation: they influence each other reciprocally. In addition, context also influences the discourse meaning for the scholar. Actually without paying attention to the sociodiscursive context of the video Vivamos como Galegos it will be difficult to grasp its meaning and the way it works within the Galician society. Galicia is traditionally one of the poorest Spanish regions, and one of the most depressed European zones, probably due to its geographical “peripherality” and to its “rurality” (rural economy and way of life). Galicians have traditionally emigrated in every part of the World. In some South American countries the term gallego (Galician) has a pejorative meaning, as synonym of stupid (as it appears also in the official Spanish Dictionary, the Diccionario de la Real Academia de la Lengua Española), and Galicians are often the ingenuous or thick protagonist of jokes. Feelings of inferiority compared to other countries or other Spanish regions are traditionally common among Galicians. At the same time, strong local identitarian/nationalist feelings also are common within Galician society. Multimodality is the presence, in the same text, of different semiotic codes (ways of expressing the meaning), as, for instance, verbal, visual, and aural. They all cooperate in persuading receivers. The relationship between signs of different semiotic codes within the same text is argumentative. Signs of different semiotic codes may be in relation of complementation (for example, images complement words), contrast (images deny words), or exegesis (images explain words). In any case, images or sounds reinforce the persuasive value of the words or vice versa. We will come back on this below with an example. 3) Epideictic discourse, which praises/blames some person or institution. According to Albaladejo Mayordomo (1999), who distinguishes between central and peripheral component, all rhetorical discourses have one main (central) component and one or many other secondary (peripheral) components. For example, conventional advertising whose end is convincing/persuading receivers for doing something (e.g. buying some product) does not simply belong to the deliberative genre: advertising has one central deliberative component (persuading receiver for buying the product) plus one peripheral epideictic component (praising the product). The video Vivamos como Galegos also has one central component and a peripheral one. But in this case the epideictic component is central: almost the entire video is aimed at praising the present Galician way of life. The deliberative component is the peripheral one: just the final slogan “let’s live like Galician” is aimed at convincing the receivers to adopt/keep the Galician way of life in the future. Certainly the video has a deliberative goal, since it is aimed at persuading receivers to buy products form GADIS supermarket, but it tries to persuade them through an epideictic discourse, which tries to demonstrate the dignity and the positivity of the Galician way of life. Persuasion is not a direct function of the discourse, but is mediated by attitudes (Petty & Briñol 2010; Petty & Wegener 1998, among many others). Persuasive discourses do not determine directly receivers’ behavior (maintaining/changing their conduct in order for doing/not doing something). Rather, persuasive discourses can change or strengthen some attitude, which in turn determines (among other variables) behavior. 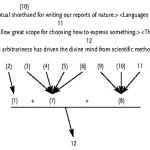 Persuasive discourse acts on receivers’ attitudes or representation, which constitute what we termed frame. Thus the effectiveness of a persuasive discourse depends on the ability of managing socio-discursive frames in order to achieve the speaker’s own interests. GADIS has to change receivers’ frame/attitudes about Galicia/n(s)/nity. Since the given sociodiscursive frame of reference is the Galicians’ sense of inferiority, GADIS tries to change this frame, by trying to persuade the receivers of being proud of being Galician, through a demonstration of how nice it is being Galician: “Let’s realize how nice we live; Let’s enjoy our way of life, Let’s live like Galician”. The evidence that the epidictique component is the central one and the deliberative component is the peripheral one is that GADIS never explicitly impels receivers to buy from GADIS. Rather GADIS merely demonstrates that the Galician way of life is the best in the world. GADIS simply invites receivers (which are Galician) to live their own way: in reality speaker and addressee are in the same group, as shown by the form let’s, which implies a subject like us, instead of a form like (you) live. 1) Receivers actively cooperate in interpreting the argumentation (Eco 1979), and actively involving them in message interpretation increases persuasion. 2) The commercial shocks receivers’ attention, which is essential for the remembering of persuasive messages. 3) The entire commercial constitutes a sort of captatio benevolentiae: it praises receivers’ way of life (receivers are Galician, as the addresser); it does not threaten receivers’ image with directive speech acts (Grice 1975; Searle 1965, 1969; Goffman 1959), as would a form like “(you) live like Galician”. Using the subject us, the speaker construes a group in which addresser and receivers are united by virtue of their Galicianity; this reduces the receivers’ sensation of being an indefinite target of a persuasive discourse, and minimizes receivers’ resistance to persuasion, increasing its efficacy. GADIS try to discursively construe and transmit an image of itself as an institution not interested in defending its own economical and commercial benefit; but rather aimed at defending the Galician (addresser + receivers) way of life. Actually the video A historia do avó [the story of Grandfather] and the campaign “Changing the dictionary” started by GADIS for deleting the connotation of ‘stupid’ from the term gallego (Galician) within the Spanish Dictionary, were both coherent with this image: GADIS defends Galicians, their way of life, and their values. At the same time, GADIS try to change receivers’ frame, from a sense of inferiority to a sense of pride (and even superiority) for being Galician. Obviously, this kind of discourse is aimed at getting the receivers’ empathy and sympathy, so they will prefer buying from GADIS supermarkets rather than other supermarket chains owned by foreigners. The slogan Vivamos como galegos, appearing at the end of the video with the GADIS logo, allows the receivers to recognize the addresser of the discourse (GADIS) and to infer: “GADIS is Galician (like us); GADIS defends (our) Galician way of life; GADIS defends us”. The commercial tries to change an existing frame, in which being Galician is seen as negative (in Galicia itself, in the rest of Spain, or in the World), substituting it with a new one, in which Galicia, Galician and Galicianity are positive. GADIS does not defend Galicia from the political/institutional nationalism standpoint, or from the position of some political nationalist party; rather GADIS just defends the local, the Galician (and in doing so it defends its particular economic and commercial ends). In order to make the message more acceptable within the Galician society (among the receivers there are nationalist but also not nationalist person), GADIS remains as most neutral as possible. So the video simply defends some features of the local identity, through the representation of some topics about Galicia/n(s) generally admitted and usually accepted within Galicia/ns. These topics displayed in the video are the discursive frame of reference. In the following lines we are going to deal with the main argumentative resources used by GADIS in order to change the existing pejorative frame about Galicia/n(s). They are: 1) the exploitation of topics of quality (Perelman & Olbrechts-Tyteca 2000); 2) the exploitation of emotiveness, humor, irony, and hyperbole. 1) The video continuously stresses the value of uniqueness, as an essential feature of Galicia/n(s): “here like nowhere else […] out there is different”. This utterance is the base for a polarized construction of the world between Galicia and non-Galicia, which characterizes the entire commercial: Galicia and its singularity are positive, whilst non-Galicia and its ordinariness are negative. GADIS changes the existing frame of reference exalting Galicia/n uniqueness as a positive feature against the non-Galician banality. 2) Irony (or auto irony) is one of the best devices for overcoming one’s defects through laughing or for minimizing them. As van Dijk (2003) argues, in every polarized description of actors, speakers emphasize positive in-group features and deemphasize negative in-group features. Accordingly, we can observe that in this video, the speaker emphasizes the in-group positive features stressing some (objective or perceived as) positive Galician habits/products/things; and it deemphasizes the in-group negative features minimizing through the humor some (objective or perceived as) negative Galician habits/products/things. Irony also allows the speaker temperate the aggressiveness of what could be perceived as a nationalistic defense of the local. Thanks to the humor, GADIS professes a sort of ironical (and funny) patriotism, which seems more hilarious if compared to the social context: the real existence of some Galician nationalistic aggressive movements within the Galician society. Within the discursive devices through which the speaker implements its discursive strategy, we can observe two main ways of re-valorizing Galicia/n(s)/nity: 1) Emphasizing positive in-group features: listing some per se positive Galician features or Galician features generally appreciated in/out of Galicia; 2) Deemphasizing negative in-group features: listing ironically “negative” Galician features for inverting them, transforming them into positive features. 1) Emphasizing positive in-group features: listing some per se positive Galician features or Galician features generally appreciated in/out of Galicia: a lot of fiestas [parties]; good and abundant foods; niceness and amiability; products like grelos, percebes, table soccer (supposedly invented by Galicians), also renowned and appreciated out of Galicia; nice beaches; etc. Everything is not just good, but it is the best in the world. It is a normal feature of the advertising discourse, but here the hyperbolic description of the positive features of Galicia maximizes their importance, accordingly to the typology sketched above about the polarized description of the world. 2) Deemphasizing negative in-group features: listing ironically “negative” Galician features for inverting them, transforming them into positive features. We normally have an initial situation, generally dealing with some negative stereotypes about Galician(s) or with some feature normally judged as negative, and a final situation where the initially negative feature has become positive. Consider one stereotype about Galicians: indolence; for example, they always respond “well” to every question. Through a pun between the pragmatic value of bueno ‘well’, ‘actually’ (used as a discursive marker) and the semantic value of bueno ‘good’, ‘fine’, the speaker states that the reason why a man always responds “well” to every question is just optimism: “we’re optimistic by nature”. In this way we can observe a discursive transformation of a frame: the same event (always responding well) is seen from a new perspective that changes it from a negative feature (indolence) into a positive one (optimism). Consider another stereotype about Galicia: in Galicia weather is always rainy. The protagonist of the video proudly says that “We’ve got chillwind…rain, rain, and…rain”. The conjunction of these words with the images of two persons happily playing in the rain allows receivers thinking about the rain in a positive way: this discursively transforms the rain into a positive feature. This last example allows us show the importance of multimodality. Verbal, visual, and aural signs cooperate in construing the meaning and in persuading the receivers. Signs belonging to different semiotic codes reinforce the peruasiveness of a message. In the video Vivamos como Galegos, we can easily observe a narrative structure where together with the main scene (S1) there are different scenes which each displays a different feature of Galicia/n(s)/nity. Each feature is represented by one scene which is visually, verbally, and acoustically different. In this way each scene works like a vivid exemplum of the Galician feature the speaker is dealing with. Consider, for instance, the change between the S1 and the S2. There are many differences between these two scenes. Differences concern images, sounds, and words. 1) Images: different characters (protagonist’s family vs. two unknown persons), different color tones (warm vs. cold), different angles of shooting (front vs. back; eye level vs. bottom-up), and different moving of the shoot (stable vs. moved). 2) Words: different discourses and also different languages. In S1 the hero itself makes a statement about the calmness of Galicia (“here like nowhere else; people is still kind here, not too stressed […] out there is different”) compared to the stress of non-Galicia (called “out-there”). Between S2-S1 there is also a switch from Galician (1-4) to Spanish (5-6) and again to Spanish (7 et seq. ): protagonists of S1 speak Galician, whilst persons living “out there” (represented in S2) speak Spanish, which works as a typical representation of the out-group language. 3) Sound: variations in the soundtrack mark the difference between the peace of Galicia (S1: people talking in their car; the sound of a beach) and the noise of the city (S2). Images, sounds, and words cooperate in construing the difference between S1 and S2. Iconical, acoustic and verbal signs together construe a dichotomy between herein (Galicia) vs. out there (non-Galicia), and between us vs. them. Obviously values are attached to these two spaces (Galicia vs. NO-Galicia): the here is judged as positive, whilst the out there is negative. Discursively construing a positive feeling about Galicia/n(s)/nity and a negative one against the non-Galicia/n(s)/nity means construing identities. Actually GADIS defends a “solid” identity against the “liquid” one which – according to Bauman’s definition (2003) – seems to prevail in the present postmodern times. GADIS defends the local identity (represented by the intimate, calm and safe, old Galicia) against the universal one (with its stress, its formality, and its unsafely large limits). GADIS protects the traditional identity (represented by the iconical, acoustical and verbal references to the family, the village, the quiet, the silence, the nature, and the rural world) from the modern one (represented by the tube, the noise, the acquaintance). GADIS defends the solid tradition against the modern liquidity. Obviously the validity of the defended values is self-justified; not proved, but instead taken for granted. GADIS’ discursive strategy only tends to the fulfillment of its commercial and economical ends, namely increasing its sells. In doing so, GADIS tergiversates its own image: instead of representing itself as an institution aimed at its own benefit, GADIS acts and speaks as the defender of the Galicians’ interests, what provided receivers’ empathy and sympathy. Indeed, the entire commercial is a sort of captatio benevolentiae aimed at obtaining the empathy and sympathy of the (Galician) receivers, who are GADIS’ potential customers. In order to obtain their benevolentia GADIS has to show them that Galicia is the best place in the world to live in. It does this by the rhetoric devices listed above (topics of quality; inversion of negative aspects into positive features; hyperbole; irony). GADIS therefore changes receivers’ representations about Galicia; whilst the speaker changes the receivers’ frame about Galicia/n(s)/ness. The benevolentia is also obtained thanks to the comic and pleasant narration, full of hyperbole and irony. GADIS uses these two rhetorical devices in at least two ways. 1) To make more pleasant its message. Accordingly to Pratkanis and Aronson (1994), the more pleasant the message is, the more persuasive and the more permanent in the receivers’ memory it tends to be. 2) GADIS uses irony and hyperbole in order to temperate the aggressiveness of what could be perceived as a nationalistic defence of local values. It must be remembered that the audience is made up of nationalists and non-nationalists, as well as anti-nationalists. The commercial shifts from the real towards the unreal, ending in a hyperbolic narration, with ironic or humoristic effects, which is highly appealing to receivers. The intrinsic nationalistic aggressiveness of the scene is attenuated due to its lack of reality. Through the use of humour, GADIS professes a sort of ironic (and funny) patriotism, which seems more hilarious if compared to the social context: the actual existence of some Galician nationalistic aggressive movements within the Galician society. Therefore, GADIS strategically uses nationalism, through its parody (Screti 2009), in order to achieve its commercial and economical objectives. [i] We wish to thank Jeremy Rogerson (Texas A&M University), for his help and his commentary on a previous version of this paper. Albaladejo Mayordomo, T. (1989). Retórica. Madrid: Síntesis. Aristóteles (1985). Retórica. (Antonio Tovar, Ed.). Madrid: Centro de Estudios Constitucionales. Campmany, J. (2005). El efecto ZP. 1000 días de campaña para llegar a la Moncloa. Barcelona: Planeta. Eco, U. (1979). Lector in fabula. La cooperazione interpretativa nei testi narrativi. Milan: Bompiani. Petty, R. E. & Briñol, P. (2010). Attitude change. In R. F. Baumeister & E. J. Finkel (Eds. ), Advanced social psychology: The state of the science (pp. 217-259). Oxford: Oxford University Press. Petty, R. E., & Wegener, D. T. (1998). Attitude change: Multiple roles for persuasion variables. In D. Gilbert, S. Fiske, & G. Lindzey (Eds. ), The handbook of social psychology (4th ed., Vol. 1, pp. 323-390). New York: McGraw-Hill. Screti, F. (2009). La banalización de la nación: el anuncio vivamos como Galegos de supermercados GADIS. [paper under review in Comunicación]. Dijk, T. A van (2003). Ideología y discurso. Barcelona: Ariel Lingüística.